The author questions himself on the “overall sense” of the work of one of the most important architects of the second half of the 1900s, attempting a unified reading of the various phases that make up his work: a first phase all centred on a re-visitation and development of Modernist linguistic canons; a second of an “urbanistic” stamp; the successive one, from the first half of the 1990s that is more poetic, authentically creative and imaginative right up to the last one imbued with religious spirituality. 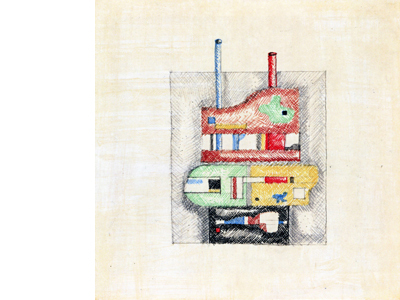 The whole of John Hejduk’s artistic work amounting to roughly 15 volumes and as many structures, both temporary and permanent, is the result of a long and intense intellectual journey which with consistent progression spans the entire second half of the 20th century. Throughout its development, it has tirelessly and lucidly explored the critical situation affecting Architecture in a society that has witnessed the evolution of established capitalism. Hejduk’s work is a vast architectural Opus that has gradually been built on the basis of an unbroken series of emblematic projects, veritable landmarks representing a continual reflection upon the essence of architecture, achieved entirely through architectural figures that are one by one defined and surpassed by developing their own individual logico-formal contents. It is the element of ideographic writing, at the same time the sum and content of his work, which on the one hand places Hejduk’s entire architectural achievement and the reflection it provokes within the philosophical tradition that relates to artwork - at the basis of which lies Conrad Fiedler’s assertion contending that the content of the representation created in the figurative work of art exists in its own right - and on the other, for reasons already explained by Fiedler, makes it a somewhat difficult subject for an overall critical understanding that does not merely resort, as has often been the case, to the elusive yet dismissive and critically useless figure of the architect-poet and its inherent idiosyncrasies. The suggestion that I would once again like to make with this short contribution is one of a critical interpretation of Hejduk’s work from the point of view of its overall sense, or rather an interpretation which despite being merely summary and not intended as an exhaustive analysis, neither in depth nor scope, imposes certain considerations needed for its evaluation as an essentially unitary and consistent corpus. An interpretation which therefore goes beyond the inevitable critical impasse resulting from those descriptive readings which instead see it as articulated in various stages, that lack continuity and bear little or no relation to one another: an initial phase which centres entirely on revisiting and developing modernist linguistic canons; a second phase, perhaps the most popular of all, with its “urbanist” slant; the next phase, dating from the first half of the nineties, of a more poetic nature and with greater creative freedom, with a rich imagery yet at the same time increasingly enigmatic; the final phase imbued with a religious spirituality that can only be explained as a consequence of the progressive worsening of the serious disease which led to his death in the year 2000. In order to begin formulating an interpretation that avoids putting forward the type of constative logic that is unable to provide us with a general understanding of the many aspects of Hejduk’s work, I believe it is necessary to take as our starting-point precisely that project which would appear to signal the moment of greatest discontinuity and which later reappears as the subject of numerous essential figurative cogitations beginning with those volumes published in the nineties. The project in question was that of the conceptually more complete Wall House, with its paradigmatic form, seen in the version called number 2. This building, also known as the Bye House and conceived between 1971 and 1972, on initial analysis clearly stands out as the climax and final moment of that long and diverse period which explores the linguistic and conceptual legacies of modern art characterising Hejduk’s project work during the sixties. It marks the threshold, the watershed following which the entirety of his works reached its first radical and irreversible turning-point. Unless the reasons for this dramatic change are to remain a source of confusion and thus relegated to the realms of subjective and arbitrary “artistic” choice, it is necessary to assume that it is precisely the radical features synthesised in this structure, its contents and its irreversible conceptual implications which raise the questions that were to play a fundamental part in establishing the new directions in which the work of New York architects will move from that time on. In order to fully ascertain to what extent Wall House 2 is significant in the overall development of Hejduk’s work, a careful consideration must be made of the fact that while in the research phase developed during the sixties, the link with modernist architecture is actually limited to the use of lexical entities and formal inflexions that are by their very nature canonical, its deep underlying concept instead centres on the attempt to transpose into the architectural sphere the most radical effects of the pictorial avant-garde which modernist architecture has left as unexplored territory. This research, which is in no way connected to a superficial modernist Mannerism and whose origins can be found in the systemisation of formal modernist characters begun in the early fifties by H. R. Hitchcock and C. Rowe, was to direct itself in particular towards Cubism. In particular, that developed later on by J. Gris whose work in those years is not by chance a point of reference for one of the most important elements of the teaching project set up by the Cooper Union. Likewise, it was to move towards the work of P. Mondrian, which centres on the Diamond Project series developed between 1963 and 1967, immediately prior to the Wall House series of which it is considered both a premise and an integral complement. It is essential to bear in mind that from a modernist point of view these specific artistic experiences, to which must certainly be added C. E. Jeanneret’s Purism and with which both the Diamond Projects and the Wall Houses have a genuine “elective affinity”, were among those that led to criticism towards naturalism implicit in the idea of spatial depth, and of the events which take place within it as a specific subject of pictorial representation, thus making a direct attack upon the idea of representation itself. This criticism, whose object is in actual fact the idea of perspective, stems from the crisis concerning its nature as a symbolic form. A crisis which is the consequence of the definitive, which is moreover already inherent in that all-definable space that was the preamble to the definition of the perspective space itself, and the irreversible secularisation of that globalism which is the technical-scientific space of the metropolis. 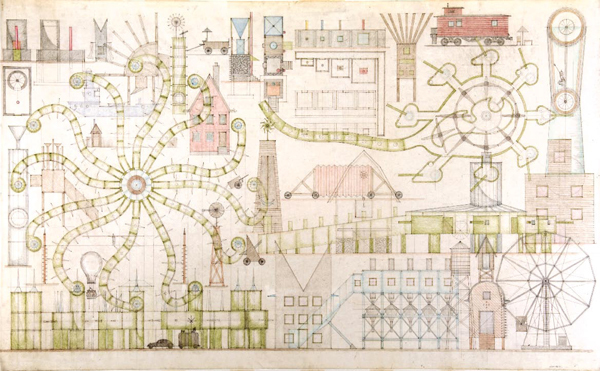 It is precisely this conceptual and perceptive criticism of spatial naturalism, with all its implications, that Hejduk’s research and more specifically the three Diamond Projects, were to make a key consideration of his architectural meditation. It is not possible to go into detail about all the conceptual stratifications and theoretical implications of the materials and procedures that determine the three projects in the Diamond series and their content. I will therefore simply point out some of the elements which I believe are enough to illustrate what has been contended above. The first significant element is Hejduk’s reflection on the series of the Lozenges painted by Mondrian during the twenties. In the process of disjuncture and conflict between the frame rotated by 45° and the structure of the composition on the painted surface which instead remains in position, Hejduk identifies the development of a peculiar spatial state suspended between the two and the three dimensions. A state that on the one hand is the assertion of the difference between the two planes, the virtual one in the frame and the real one that expands virtually sideways into infinity within the composition’s grid, and on the other by the total compression of the conceptual distance between them, to the point of obliteration. This state is fully translated in Hejduk’s architecture at plan level by means of a square structural grid contained within a perimeter rotated by 45°. The second element is the realisation of originality achieved using the rhombus as a planimetrical figure, thus the realisation that in its isometric representation, i.e. in representing three-dimensionality, this figure becomes a vertically-rotated square which then compresses that three-dimensionality between itself and the plane of the drawing until it is completely suppressed. In the case of a structure with a series of overlapping floors this ensures that the three-dimensional nature of the architectural subject is perceived, whilst also preserving the two-dimensional abstraction of a series of floor plans projected one above the other. The third element is the consideration of the rhombus from the point of view of a perception of its actual spatiality. The theme here again concerns the compression of both the internal and external spatial depth of the rhombus on the two-dimensional surface of a plane of perspective projection that occurs when the figure of the rhombus is viewed head-on, in other words by positioning oneself opposite one of its vertices. The surface on which the perspective compression of the actual depth takes effect, and which we can define as the plane where the sensations of the subject arrange themselves, coincides with the same diagonal of the rhombus according to Hejduk. It is thus precisely this annihilation at the various levels of the architectural representation of spatiality, represented by the perspective and paradoxically reduced to the limit of pure conceptuality, which runs parallel to the projection plane, linking Hejduk’s research to the core of the research relating to the pictorial avant-garde movements of the 1900s. With these aforementioned movements, far from suggesting that the “classic” space is replaced with a “modernist” equivalent in any shape or form, as indeed the architecture of the time was to do with a few exceptions, that much more generalised and extreme criticism towards the idea of space itself was to arrive at a definitive formulation, by means of the criticism directed at the “old and outdated perspective”, in the words of Hejduk himself when he presented the Diamond Projects. Namely that criticism of even the possibility of the idea of space as a background and metaphysical foundation of the representation. With these three projects, along with these experiments carried out with the precision and detachment of a lab technician, in accepting both the result and the recognition, Hejduk achieves through architecture that which has already taken place in avant-garde art movements with regard to the subject and its space. Namely the elimination of the representative which according to architecture corresponds to the very idea of space as its metaphysical basis, a naturalism on whose Ratio the forms and methodology of the project are based, enabling them to take shape. In the Diamond Projects, therefore, behind the surfaces in which spatial depth retracts, that which remains and which paradoxically stands out is the emptiness. Importantly, it is not however merely empty space, but rather that emptiness of that space which beginning with a humanistic perspective – it is in fact this historic context that Hejduk’s work finds its true meaning – forms the foundation and content of every representation, namely the very space of the sense, it is absence, its absolute negation. The wall of the Wall House signifies this emptiness, the only possible representation of that absence. It can thus be affirmed that the structure conceived by Hejduk proposes itself as a direct antithesis of the Brunelleschian project for the Santo Spirito church: if in fact with this project, the beginning of a tradition which is still alive even today and upon whose aporia Hejduk’s architecture is one of the most lucid reflections, the modern era has based the meaning of architecture on its being a symbolic form of the universality of natural space, thus providing that ideal diagram of formal arrangement, the mathematical grid, in which all of the entities as individual items take part in and belong to the organic unit of it all, antithetically the three structures that Hejduk superimposes when configuring an arbitrary assemblage near the wall of Wall House 2 instead convey a sense of an absolute and irreducible heterogeneity: on eliminating the representative, namely the space as the metaform that joins them as parts of the whole, those structures are found to be entirely autonomous, isolated in their absolute freedom and entirely without roots. Only the wall, the indicator of that disappearance which is what unites them, anchors them in a state of proximity yet without removing the insurmountable difference. It is Wall House 3 which explains these problematic conclusions: basically consisting of a single isolated volume, it is understood that it is rootless against any kind of metaphysical background and suspended in its state as a part without everything. In the first of a series of 4 projects in allegorical form developed by Hejduk for Venice, deprived even of a single specific word, this single, isolated structure with its shapeless appearance, confined within the boundaries of a raft that is inexorably anchored to its walled enclosure, finds its natural mooring place, although still temporary in that it is a subject by its very nature nomadic, in the waters opposite the western outskirts of the foundationless city, that city made up of “a hundred profound solitudes” combined, which according to Nietzsche forms “an image for the man of the future”. A few years later the same subject, repeated 18,000 times, was to be the unity of the residential fabric for the fourth Venetian project, the “New City for the New Orthodoxies”, a project that whilst inevitably never completed, pointed to the urbanistic direction which Hejduk’s work was to take from then on. The reasons behind that turning-point are to be found in precisely that lucid reflection which Hejduk was to go on with that architectural canon brought to light by the Wall Houses. Freed from the representative as has been explained, namely free from the obligations towards the subject of its representation, a subject which nevertheless constituted and secured its meaning, and was therefore entirely autonomous in its content, in Hejduk’s eyes Wall House 3 became the driving element. The forefather not only for that series of subjects characterised by a zoomorphic physiognomy that has all to often been made to coincide with the core of his work, but in particular, beginning with his nature characterised by the architectural ideogram, the inspiration for an unrestrained and uninterrupted proliferation of surprising and at times bewildering inventions and architectural variations. It is precisely this potentially infinite proliferation of structures, their nomadic nature and the inherent indeterminateness of their incessant disseminations and gatherings, in turn also infinite in their possible permutations, provisionally enclosed within the perimeter of the drawing sheet or gathered in the grids and lists of equally provisional and infinite taxonomies, veritable Foucaultian heterotopies, that poses a general problem for Hejduk’s architecture consisting of that crisis of meaning that each infinity brings with it. At the same time the experience with Venice was to lead Hejduk to recognise from that time on in his search for new compositional methods and shapes, for new forms of urbanism, the necessary and vital attempt to in some way reformulate precisely those infinite disseminations into new forms of community. 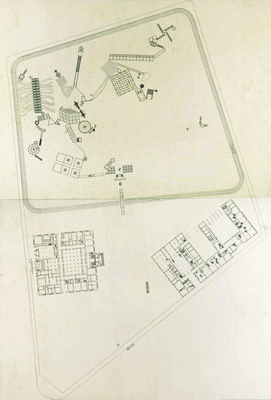 The urban projects which Hejduk was to develop beginning with the hypothetical rural community of Lancaster-Hannover designed between 1979 and 1982, and the great plan put together in 1999 bearing the significant title “A Gathering”, and that can perhaps be considered the true plan of the “New City of the New Orthodoxies”, actually find, and this is the key point, their own specific meaning in the untiring attempt to achieve definition in the shapes of new project configurations, of the possibility of a new artificial dimension. Namely in pursuing the possibility of/need for a re-formulation of a potential new level of meaning for a style of architecture whose features instead risk becoming undecipherable and voiceless. In doing so, Hejduk was nevertheless always to avoid giving in to the temptation of a nostalgic re-establishment of a false symbolic state that would allow his architectural structures to once again speak the language of a basically anachronistic metaphysical foundation. Nor was he to be seduced by the equally nostalgic new mythologies on which new and ephemeral universal languages could hypothetically be based to create a reassuring new orthodoxy. I will briefly illustrate just two examples of the results from this research here. In the Berlin project entitled “Victims” a collection of 65 diverse architectural structures, that were originally haphazardly disseminated on delicate sheets of rice paper in the form of black randomly-numbered hieroglyphics, veritable heteroclitic icons, look to the planimetry of the project for a possible material state that would unite them, namely to recognise each other in a seemingly improbable unit, touching one another in a single point, in an attempt to overcome the impossible distance that separates them, confirming it rather than actually bridging it, with an almost Beckettian gesture, with the dramatic and silent act, perhaps the only way open to them, of a purely physical contact. 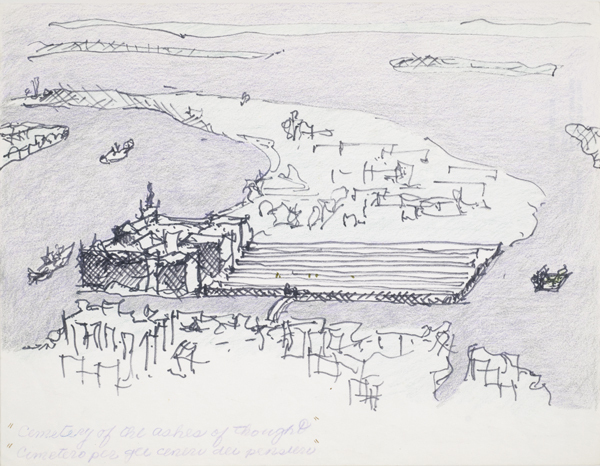 At the other extreme, as accessories to the previous project and doubtless one of most successful moments of his lifelong artistic achievements, we are able to place his great collective drawings in which Hejduk gathers the architectural styles from the vast and heterogeneous catalogue consisting of the Lancaster-Hannover project, but which could quite rightly also refer to the plan of the “Gathering”. 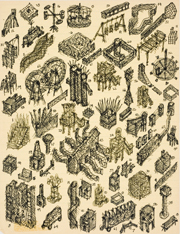 These complex drawings made up of the simultaneous assemblage of plans, cross-sections and views of diverse and autonomous structures, devoid of any naturalistic spatial conception, achieve a means of overcoming, by way of accidental overlaps and transparencies of exclusively two-dimensional drawings, the total isolation of each structure and the incongruity of their combinations in a possible form of synthesis based entirely on concept where the understanding of a new organic totality may take place only in the unusual state of a transcendent intuition. According to Hejduk, it is here that not only the possibility, but also the necessity of a poetic language is re-established, the only language that may enable Architecture to communicate both about and to the World once again. On this occasion, we are unable to examine the rest of the work that Hejduk was to continue developing throughout the nineties and to publish in “Adjusting Foundations” and “Pewter Wings, Golden Horns, Stone Veils“. I would simply like to point out, with regard to the investigation into the subject of the theme of representation and that will become a long series of rewritings on the theme of the Wall Houses and in a series of chapels and churches, the possible link of complementariness between the above and the concept of cosmology which these latter buildings clearly express. In respect of the last significant project, designed for a cathedral that collects a series of projects of the building itself embedded in its walls among which that for Wall House 3 stands out, in the face of the solipsism that the structure would seem to express, I would like to suggest in the words of the Portuguese poet Fernando Pessoa, “the soul that feels and thinks, the universe that I am for myself”, the form of another of the many and unavoidable end games which Hejduk’s diverse works embody as their destiny. Guido Zuliani is Professor of Architecture at the Irwin S. Chanin School of Architecture of the Cooper Union in New York, where he has taught since 1986. He has collaborated at both a teaching and professional level with Raimund Abraham and Peter Eisenman. His publications include: P. Eisenman, Evidence of Things Unseen, London 2006, and La Città Implicita (on the Cooper Union), Milan 2008.